The Isle of Skye, connected to Scotland’s northwest coast by bridge, is known for its rugged landscapes, picturesque fishing villages, and medieval castles. The largest island in the Inner Hebrides archipelago, it has an indented coastline of peninsulas and narrow lochs, radiating out from a mountainous interior. The town of Portree, a base for exploring the island, features harbor side pubs and boutiques. The Isle of Skye takes its name from the old Norse sky-a, meaning &apos;cloud island&apos;, a Viking reference to the often-mist-enshrouded Cuillin Hills. It&apos;s the second-largest of Scotland&apos;s islands, a 50-mile-long patchwork of velvet moors, jagged mountains, sparkling lochs and towering sea cliffs. The stunning scenery is the main attraction, but when the mist closes in there are plenty of castles, crofting museums, and cozy pubs and restaurants. Along with Edinburgh and Loch Ness, Skye is one of Scotland&apos;s top-three tourist destinations. 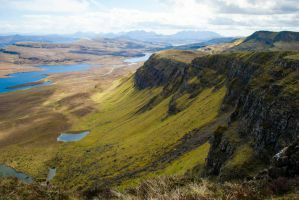 However, the crowds tend to stick to Portree, Dunvegan, and Trotternish – it&apos;s almost always possible to find peace and quiet in the island&apos;s further-flung corners. The Isle of Skye is a beautiful place with plenty to offer, and these hostels provide an excellent base for exploring the area. How much do hostels in Isle of Skye cost? What are the best hostels on the Isle of Skye? Skyewalker has a choice of rooms from twin private bunks to the more sociable 10 bed dorm. They also have twin en suite rooms and the Skyewalker Jedi Huts available. The property is situated on the stunning Minginish peninsula giving easy access to the Cuillin mountain range. It’s location on the west coast makes for spectacular sunsets and gives you an ideal base for exploring the beautiful Isle of Skye. The rural location means you are surrounded by unspoiled natural beauty. There is a great beach within walking distance with regular sightings of whales, dolphins, and basking sharks as well as Skye’s famous eagles. The hostel is only a five-minute walk from the local hotel which serves meals and has a cozy bar, very popular both with locals and visitors. The nearest shop is in Carbost. The world famous Talisker distillery is less than 3 miles from the hostel and well worth a visit. Portree, the capital of the Island is only 25 minutes away by car or local bus. The Hostel has a well-equipped self-catering kitchen and a large garden area for recreation and barbecues. There is also a cool ‘chill out’ glass dome for guests to relax in. Skyewalker Hostel hosts regular Scottish folk music sessions and has instruments available for guests to use. Only guests 18 and over are welcome. Free parking, Wi-Fi, and linens are included. 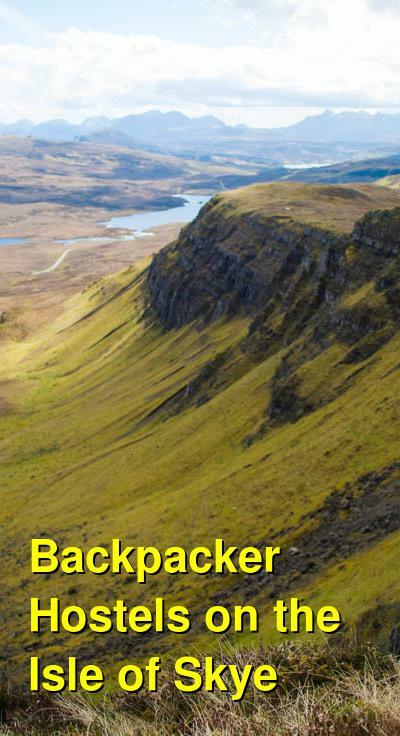 Skye Basecamp offers the perfect base for exploring the Isle of Skye. They offer beds in small shared dorms, private rooms, and a self-catering apartment. Facilities at Skye Basecamp will particularly suit outdoor enthusiasts including walkers, climbers, paddlers, and naturalists. They have hot power showers, comfy solid wooden beds with all bedding and linens provided, and a great drying room. The large kitchen/diner is the hub of the hostel, with everything you need to create culinary masterpieces provided. The stunning view of Broadford Bay dominates the spacious and relaxing lounge, and there&apos;s a pool table in the adjacent conservatory. Free Wi-Fi, storage, laundry facilities, and off-street parking is also available. Basecamp is owned and run by Skye Guides, the island&apos;s biggest mountain guiding company, and guides and staff are always willing to share their in-depth knowledge of Skye and offer free advice on current mountain conditions and route details. The seaside village of Broadford is right on the main A87 road through Skye and only a 10 minute drive from the Skye Bridge. Occupying a quiet spot in the center of the village, guests can enjoy an eclectic mix of shops, restaurants, and pubs which are all just a two minute walk from the front door. A short walk to the beach might reward you with sightings of otters, seals, and other wildlife commonly seen, and all of Skye’s main sights and attractions are within an hours’ drive. There is a bus top within 200m where buses servicing the rest of the island as well as Inverness, Glasgow, and Edinburgh stop. Guest&apos;s must be 16 or older. Free parking, Wi-Fi, and linens are included and towels are available for hire. The hostel is situated in the scenic village of Broadford ideally located for enjoying everything the island has to offer with access to public transport to get you all around the island and surrounding mainland. The village of Broadford has a wide range of facilities, including restaurants, bars, and a supermarket. The hostel itself offers safe, clean, and comfortable accommodation with a personal touch. In the hostel there is also both indoor and outdoor communal areas. They also offer a fully equipped kitchen with everything you need to cook up a nice meal and laundry facilities on site where you can both wash and dry your clothes. The communal area has a TV and comfortable seating arrangements with board games and a place to make tea or coffee. The facility offers both dorm rooms and private rooms. Dorm rooms are available with single beds and bunk beds. Private rooms include twin (2 single beds), double (1 double bed), and family (2 bunk and 1 double bed). Free parking, Wi-Fi, and linen are included and towels are available for hire. Skye Backpackers sits in the picturesque fishing village of Kyleakin, skirted by mountains and sea. It’s a small, cozy hostel with an open fire in the lounge and a lovely backyard garden. With its lively pub atmosphere and quiet, comfortable accommodation, Kyleakin is the perfect place to come to escape the stresses of city life. The Isle of Skye is one of Europe’s most dramatic and haunting lands, and words can do little justice to describe Skye’s awesome beauty. The majestic Cuillin Mountains dominate a rugged landscape that is peppered with lochs and tiny fishing villages. Take some time to explore the island’s haunted castle ruins; feel the mysterious presence of the legendary faeries in tranquil glens, waterfalls and mountain pools; visit whiskey distilleries and sample local beers and ales; take a relaxing stroll through the countryside or boldly ascend a mighty mountain. The hostel offers a variety of accommodation from standard mixed and female dormitories, and a basic dormitory, which is a converted caravan situated in the back garden. The property offers: fantastic views, a cozy atmosphere, free tea, coffee, and hot chocolate, a self-catering kitchen, bed linen included, optional breakfast (for a small fee), free parking, free Wi-Fi, laundry service, towel hire, and day Tours of the Isle of Skye.